Many backyard barbecue enthusiasts don't let a little wind, snow and frigid weather keep them from grilling with a propane grill in the winter. When grilling your eats over a flame is your cooking method of choice, throw on your coat and fire up the grill. You won't find it that much different to grill during the winter than in the summer. Use a propane grill in cold weather to prepare tasty steaks, burgers, chicken or franks. Use a propane grill in the winter too. Find a place for your grill that shields it from wind, if possible. Never place your grill in an enclosed area, however, and don't place it under any type of overhang that can be a fire hazard. Check all the connections and ports before lighting the grill. Make sure all tubes and connections are tight. Open the grill and turn on the gas. Light the grill and close the lid to allow the grill to heat. 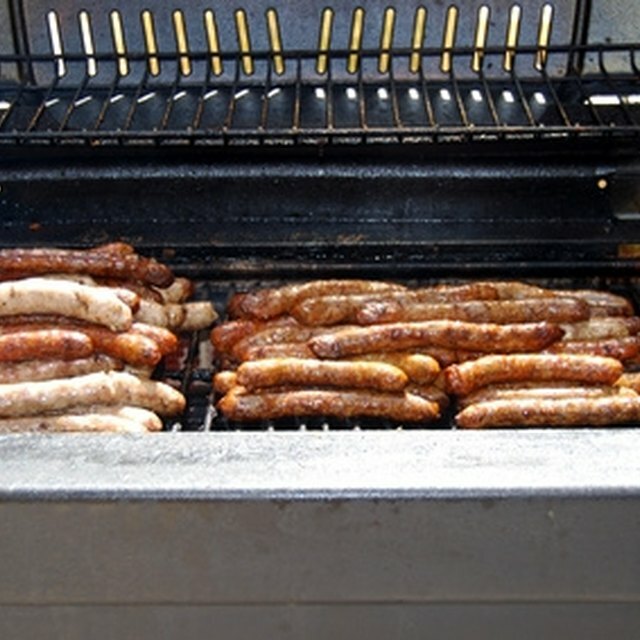 It may take over 15 minutes for the grill to heat sufficiently in cold weather. Turn down the flame a bit after the grill preheats. Add the foods you wish to grill and close the lid again to conserve cooking heat in the grill. Watch the cooking progress--from indoors or while standing at the grill. If it is windy, make sure the grill flame stays lit. Because the grill needs to stay hot enough to cook the food, you may have to turn up the flame if the temperature is really cold. Remove food from the grill when it finishes cooking. Shut the grill off and close the lid. Expect cooking to take longer when you grill in cold weather. Do not use recipe cooking times as absolutes when grilling in the winter. Dress warmly before heading out to grill your food. What Pressure Does My Propane Grill Need?